9th May, 2017. London, UK. Advanced Logic Analytics (ALA), a provider of enterprise wide big data and analytics solutions for buy- and sell-side institutions and other financial firms, is pleased to announce the introduction of advanced finance analytics to help financial markets firms reduce downside investment risk and achieve upside potential. 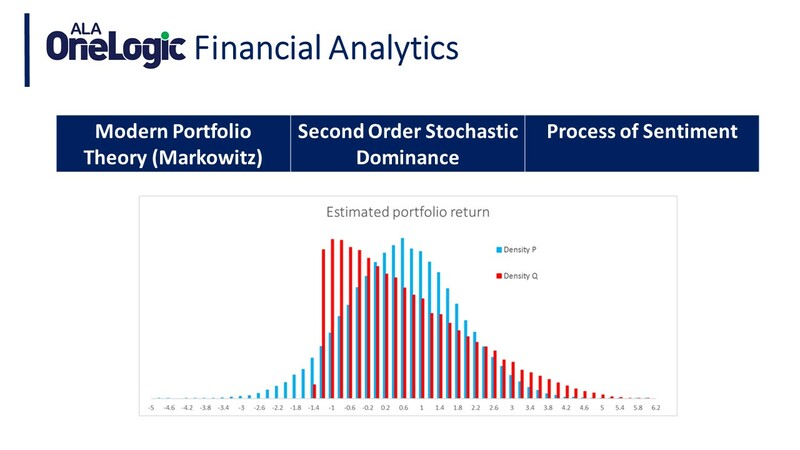 These new analytical tools, part of the ALA OneLogic suite of big data and analytics solutions, offer quant-based augmentative strategies for portfolio composition using the proven academic concept of ‘second order stochastic dominance’. The underlying algorithms focus on the entire distribution rather than a few statistical moments, leading to reduced downside risk and enhancing upside potential. Portfolio managers and other users also receive a daily buy/sell trading signal. The analytical tools use data from trusted market data and news providers and combines that with data mined from around the web. The mood of the markets is then captured and analysed, providing deep insight into upcoming influential events, such as elections. These early indicators help investors gain a competitive edge in portfolios before events impact the markets. “Through our team of leading academics, we have developed unique solutions using behavioural, sentiment and emotional finance to give investors a window into market opportunities a leading edge over the market,” he continued. The ALA OneLogic range of finance analytics includes: portfolio construction and sentiment analysis. Advanced Logic Analytics (ALA) is a provider of big data and financial analytics solutions. In addition, we are the only company to provide a quant-based augmentative strategy for a firm’s portfolio composition. ALA’s core analytics platform, ALA OneLogic, allows financial markets firms to analyse and process massive amounts of structured and unstructured data in real-time, plus undertake pre-emptive, descriptive, and predictive edge analytics augmented with behavioural and emotional analytics. These advanced analytics are accessible, easy to use and built for big data. Using the most advanced algorithms developed from over 10 years of academic research and connecting to any data source securely, ALA OneLogic identifies and catches signs of bubbles, market trends, overconfidence in M&A deals, and other useful indicators, in any language, and across jurisdictions. ALA believes that business driven decisions should be firmly rooted in advanced analytics, not instinct.